In the first decade or so, there were plenty of books written about the Peace Corps, but few were by scholars with backgrounds in development, or expert host country knowledge. In the case of our book, every country chapter was authored by a social scientist or historian who knew that country reasonably well, had lived there, had done research there, etc. All of our 14 contributors had had graduate level training or the equivalent, and most of them were professionally established PhDs. In addition, all of them had had some kind of meaningful contact with the early PCVs – as trainers, evaluators, etc.-- in their country of expertise. "CULTURAL FRONTIERS OF THE PEACE CORPS"
Here is some background on the book, "Cultural Frontiers of the Peace Corps" (MIT Press, 1966) which, as of March 1, 2011, was made digitally available to the general public, thanks to the generosity of the MIT Press and the Stanford University Libraries. I was the organizer and editor of this book, and contributed the conceptual chapters. I worked with 14 contributors, each of whom provided a chapter on the Peace Corps Volunteers in a particular host country with which he was deeply familiar. In addition, the renowned anthropologist Margaret Mead provided a wise and prescient Foreword. 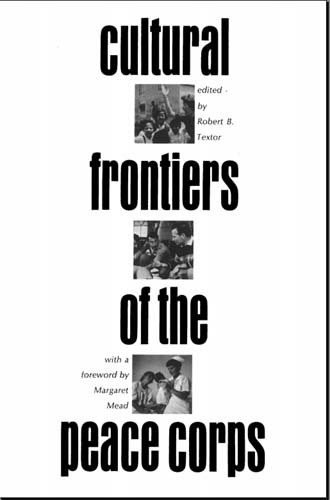 GETTING PERMISSION: Just a few weeks ago I rang up the MIT Press, and inquired as to whether they would be willing to surrender their rights to "Cultural Frontiers," so that Stanford (where I taught for 26 years) could digitize the entire book and make it available to anyone who wanted to download it or search it. I pointed out that 2011 is the PC's Golden Anniversary year, and suggested that this gesture would be a great way to honor a great organization, as well as the Massachusetts President who created it. To my astonishment, almost overnight, Ellen Faran, Director of the MIT Press, approved the request, and "transferred back" the rights to the book, as an edited volume, to me. Thanks to Ms. Faran and staffer Pamela Quick. GETTING IT DIGITIZED: The Stanford Libraries responded with equal alacrity to my suggestion that they do the digitizing, and they succeeded in getting this done by March 1 – fifty years to the day after JFK signed the executive order creating the Peace Corps. Thanks to Stanford Libraries' Mimi Calter and Stu Snydman. The Stanford timing was fortunate for another reason. Stanford will have its own Peace Corps golden celebration on April 15-16, honoring and thanking the 1300 Stanford men and women who have served as PCVs. * What changes were needed so that they could function more effectively? SCHOLARLY EXPERTISE: In the first decade or so, there were plenty of books written about the Peace Corps, but few were by scholars with backgrounds in development, or expert host country knowledge. In the case of our book, every country chapter was authored by a social scientist or historian who knew that country reasonably well, had lived there, had done research there, etc. All of our 14 contributors had had graduate level training or the equivalent, and most of them were professionally established PhDs. In addition, all of them had had some kind of meaningful contact with the early PCVs – as trainers, evaluators, etc.-- in their country of expertise. * Dr. George M. Guthrie, psychology, Pennsylvania State University, the Philippines. * Mr. (later Dr.) David L. Szanton, RPCV, anthropology, the Philippines. * Mr. (later Dr.) Alan E. Guskin, RPCV, social psychology, Thailand. * Dr. Gerald S. Maryanov, political science, University of Iowa, Malaya (later Malaysia). * Dr. Louis Dupree, anthropology, American Universities Field Staff, Afghanistan. * Mr. (later Dr.) Frank J. Mahony, anthropology, Somalia. * Dr. William H. Friedland, sociology, Cornell University, Tanganyika (later Tanzania). * Dr. L. Gray Cowan, political science, Columbia University, Nigeria. * Dr. Vernon R. Dorjahn, anthropology, University of Oregon, Sierra Leone. 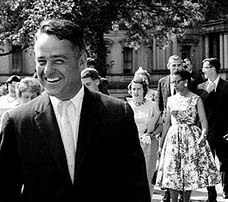 * Mr. Charles F. Gallagher, African and Arabic Studies, American Universities Field Staff, Morocco and Tunisia. * Dr. Lambros Comitas, anthropology, Columbia University, Jamaica. * Dr. Paul L. Doughty, anthropology, Indiana University, Peru. * Mr. (later Dr.) David Scott Palmer, RPCV, international relations and Latin American Studies, Peru. * Dr. Dwight B. Heath, anthropology, Brown University, Bolivia. In other words, our authors were scholars, not journalists or generalists. Our aim was to use our expertise to produce reportage and analysis that the general public – not just other specialists -- would find interesting and useful. 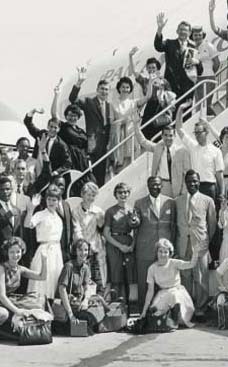 In her thoughtful Foreword, Margaret Mead articulated this aim beautifully: "The authors have made a mighty effort in the direction of the purposeful inclusion of the whole potential audience in order that, in the end, each reader will appreciate the achievement and wish to correct the defects in the still developing program of the Peace Corps." Incidentally, seven of the 14 contributors are still living, and you may well see some of them helping to celebrate the Golden Anniversary. To further ensure accuracy, balance and quality, every one of our country chapters was vetted in manuscript by at least one RPCV who had served in that country, and often by two or three. ROYALTIES: All net royalties from sale of the 1966 book were contributed to the Peace Corps, which ended up using the money to promote biogas generation in a village in Nepal. In the case of the current digitized edition, no royalties or other income is involved. IMPACT: Fortunately, PC/Washington liked our book and ordered four thousand copies for inclusion in the "book lockers" that were sent to every Volunteer household in the world. In addition, the Japan Overseas Cooperation Volunteers – "Japan's Peace Corps" -- used parts of "Cultural Frontiers," in translation, in their training programs. We also had good luck with reviewers. For example, the Peace Corps organ, The Volunteer, ran a review by Sam Selkow, RPCV from Ghana One and at that time an African Regional Program staffer. His conclusion: "At last we have a book which is neither simple-minded nor arcane; but one which comes closer than any other to describing the poetry, the vision and the promise of the Peace Corps." RELEVANCE TODAY: RPCVs who have recently read "Cultural Frontiers" have opined that many of the Peace Corps' problems and challenges of the Sixties, which the book describes, remain problems today. However, reports suggest that the book has had little impact on recent PC staff. One of the purposes of digitizing the book is to provide a means by which those staffers who wish to develop a better understanding of the history of their organization, can do so in a convenient way. MAXIMIZING AVAILABILITY: The whole purpose of digitization is, of course, to maximize the availability of "Cultural Frontiers." For example, one official in PC/W has explained to me that ‘Cultural Frontiers" will be made available to PC posts overseas, and that staffers at some of those posts, in order better to reach PCVs at their upcountry work sites, might want to upload the book, in pdf, to the post's internal SharePoint (file-sharing) site. They have asked: Would such uploading be OK? The answer is Yes, absolutely. If there are any questions about such matters, please contact me at the e-address below. HOW TO DOWNLOAD: Simply google < textor stanford > and the top item that comes up will be my Stanford home page. Then click "Publications." Then click "Cultural Frontiers." Allow up to two minutes to download.